Brushes allow for painterly styled strokes and fills – also used to select brush styles for use with the Quick Mask and stroke styles with the Path tool. Also used to set Pencil, Dodge, Burn, or Eraser tools. Choose the Brush tool (B os Shift-B). 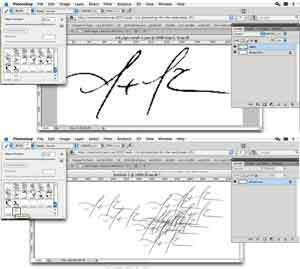 Use Airbrush icon to control paint spread and build up using the mouse as in a traditional airbrushing. To create a straight stroke hold Shift while dragging. To choose temporary settings for a Brush Pre-set. Choose any tool that uses Brush Pre-sets. Use [ key to decrease brush diameter or ] to increase diameter of brush. Choose Expanded View if needed to show option sets on left side of panel. Check box for options set to activate. Set display option of brush menu to view thumbnails, text only etc. To create unique brush more suitable for your use then provided by pre-sets. Choose Smudgetool (on Blur tool pop-out menu). Normal: smudges all colors and shades. Darken: pushes only dark colors into lighter ones. Lighten: pushes only light colors into darker ones. Hue, Saturation and Color: smudges only the color attribute without changing tonal values. Check Sample to smudge all layers. Deselect to smudge only on active layer. Block: square shaped eraser with no Option bar settings – good for individual pixels. Choose Flow to control uniformity of the erasure (while using Brush). To Lock or not to Lock: when erasing on a layer other then Background. Lock Transparent Pixels – ON: erased area will fill with Background color. Lock Transparent Pixels – OFF: erased area will become transparent. Tolerance value: to set range of colors the tool will erase. Anti-alias: to slightly soften edges. Contiguous: erase only pixels adjacent. Uncheck will erase similarly colored pixels throughout image. Sample all Layers: to erase colors on all layers. Uncheck to erase only on current layer. Click on area(s) to be erased. Custom Brush will appear last in the Brush Pre-set menu. To match overall color and tonal values between different images. Use when subject matter is the same but have slightly different lighting conditions or where taken with different camera settings. Works best with images of the same or similar content (such as a landscape series). Open a Source image (with desired color and tonal values) and a Target image (that which you want to adjust). Using the Target image choose Image>Adjustments>Match Color to open dialog menu. Target image will instantly adopt values from Source image. From Image Optionsadjust the following values as desired. A sample Selectioncan be used to work within a more specific color value range. Create a Selection in the Source image prior to using Match Color command. Cloning:match pixels from one layer to another or even one image from another. Choose from the Brush pre-set and adjust brush settings if desired. Check Align to maintain the same distance from the Source point. Uncheck Align to sample from a single area. From Sample menu choose All Layers to sample pixels from all the currently visible layers. Create a new layer in the Target document, and keep it selected. Alt-click/Option-click in Source image on area to be cloned. Click and drag in the Target document to reveal cloned pixels. Adding a watermark:protect your on-line work with your own signature, logo or even copyright notice. To embed a copyright watermark into a n image. Click on the Style picker then click Default Style (None). Click the Color swatch. In Color Picker, choose white as Foreground color – click OK.
Shift-drag in the document window with the tool until symbol is desired size. Double-click next to shape layer name to open Layer Styledialog. Use the Move tool to reposition symbol if necessary. On the Styles panel click the New Stylebutton. Follow the steps above to create a watermark but use the new shape found in Custom Shape picker. To save a watermark shape and style as a tool pre-set. 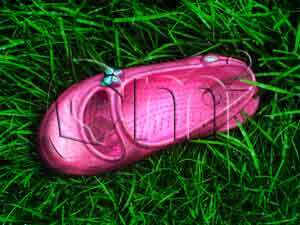 Follow steps to create a custom watermark. Choose the Custom Shape tool (U or Shift-U). On Options bar make sure the desired custom shape displays in the Shape thumbnail. Click Style thumbnail on Options bar to open Style picker and select custom style. Display Tool Preset (click on Option bar icon or Window>Tool Presets). Click your tool pre-set on Tool Preset panel. Shift-drag tool into the document window. Transform as desired in image.